So before we get to the meat of the matter, I thought I'd just give you a little background on how this all came about. 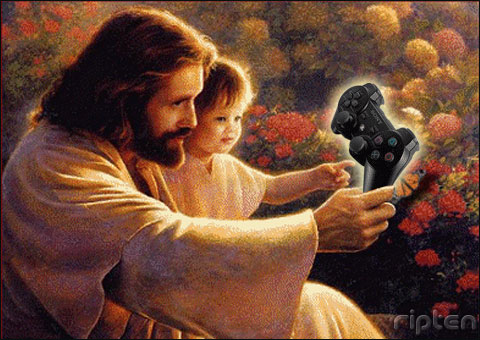 For the past few months, me and my friend Matt have been having a back and forth conversation (some parts in person and some parts through email) regarding gaming and being Christians. Matt, legitimately one of the nicest guys I know, who besides being a father, a friend, and a "former gamer", is the associate pastor at the church I go to. And I say "former gamer" because he sold his Xbox 360 this past year leaving his home devoid of any gaming consoles (at least current gen?). However, if a great game does come out and if time permits, he indulges at a friend or relatives house. Also good to note, we both have similar gaming upbringings; that being the heavy influence of the 8-bit and 16-bit era, and in particular, Japanese RPGs of yesteryear. Anyhow, it all started a few month ago when we started talking about gaming in general, but more specifically, achievements and achievement points. You'll see, over the course of the series, how our conversation transitioned from something as lowly as AP's into something more edifying and deep as it relates to us being Christians. We've gotten a few emails down so far and he gave me permission to share with you all our conversation. I'll publish them two at a time or as the dialogue continues. So I was thinking about our conversation last Sunday about gaming and I had a few thoughts in regards to achievements (and I know online, that it’s a big discussion point). I like the idea of Achievement Points, not for its competitive nature, which some people view it as, but rather as an indicator that I did all the things that the developers planned for the user to do. I suppose it’s to satiate the completionist side of me that sometimes rears its head. And I say ‘sometimes’ because I don’t do the same with every game obviously. I sort of choose my battles carefully before entering them. I think as a general rubric, I strive to accumulate as many points that I can, without really going out of my way to pick up anything that I may have missed. But I’ll have in mind what I’ll want to do by just looking at the list of achievements beforehand. Depending on whether I love the game, I’d move on from there. For example, for Final Fantasy XIII, I chose to undertake the 100%, because of my personal love for the series in hopes that the 1000 points would reflect that. Clearly, I wouldn’t do the same for something like Kung Fu Panda. I mean, I’m sure it would be easy to accumulate 50% of the points (50% is what I feel comfortable leaving each game with) but would it be worth my time to play in general? As to all the other achievements that are more ancillary to the game, like the ones you mentioned on Sunday, I like to look at it this way. In the perspective of a mountain biker (this just comes to mind first cuz my cousin just did an amazing race in the mountains of Bolivia), do you see the mountain as an hindrance or an open challenge. How high is too high, and should you even attempt to climb it? In a lame kind of way, sometimes that’s how I look at achievement points. Is the mountain to achieve those points too high? But thankfully (or bitterly) we live in the internet age, with information and resources aplenty at our disposal, which makes it a simple process of going to your favourite forum to see how long and difficult it was to attain certain achievements (the time versus effort gauge). So if the mountain is much too hazardous or dangerous to climb (as I hear Call of Duty: World at War is), at least you can know beforehand. And now I want to point-counter-point myself. I realized this later on in the week. I wrote a few paragraphs above that achievements could be “an indicator that I did all the things that the developers planned for the user to do”. While it could be true, at the same time, the confines of the game can be exposed. For example, Grand Theft Auto IV. There are a plethora of things that you can do post-game, but after I nailed all those extra achievements, why bother even touching everything else? So there can be world’s out there, but I’m just limiting myself to the different exercises that gain me achievement points. In part, I think that’s where the designers of Starcraft II got it right. There is an achievement system within the game. But you don’t find out until after you finish a mission what those achievements are, that you achieved or didn’t achieve. I wonder if hiding the achievement list could be an option. Wouldn’t that be what game publishers want? People just dumping hours upon hours into their game? It would make games a journey of discovery than of just grinding (although it could be a combination of both given the circumstances). Anyhow, that’s all I’ve got for now. I’m open to your rebuttal. I finally had the time to read through your email. Good stuff! Here is my reply. I was hoping that you would talk about or defend the actual time spent in pursuing AP's. My thoughts on video games often revolve around whether or not they are the ideal hobby for me, even though I am naturally good at them and I naturally enjoy them. My thoughts on AP's therefore, are mostly about, what's the point and is it worth it? I ask these questions mainly out of a desire for obedience - to be obedient to God's plan for my life. The tricky thing about it is, how do I know what God's plan for my life is and therefore, what obedience looks like for me. In other words, do video games in general (and AP's in particular) align with how God sees me living my life to its potential? This is a tough question to ask but important for anyone who wants to take discipleship seriously, honor God brightly and experience the John 10:10 life. I think sometimes, just being willing to seriously ask the question is a victory. So, you mentioned that you view AP's "as an indicator that you did all the things that the developers planned for the user to do." That's an interesting and possibly valid way of enjoying the video game experience. But, as far as justifying whether or not it's worth the time, it doesn't answer that question. Because, do the developers want what's best for you or do they just want your loyalty to make more money? Or possible, some may actually want to teach you something or expand your view of something, etc. but once again, do they understand the best way to do that? I think it's up to us to make that call - and individually because we're all different. But you know this stuff. So, here is my personal experience. I found that not only did video games eat up a large amount of my time and money, I found they also dulled me mentally and spiritually. That's just the honest truth but I'm not taking that as certain evidence that it would have the same affect on all people. I speak in front of people and for that I think my mind needs to be really sharp, and I could feel it get "mushy" when playing video games. I also need time! I have very little of it it seems, so much to do and so much I want to learn, experience and accomplish. I suppose it's my ambition that makes video game playing difficult for me, but from another perspective, it could be my lack of self-control. Maybe it's because when I do play them, I usually have to sink hours into them, because I have the desire to conquer all, get the AP's, max out stats, see every level and unlock every secret. I have an addictive personality and I like to "collect", ever since I was a kid, I used to collect key chains, shells, rocks, comic books, action figures, sports cards, etc. So maybe its for these reasons that I have a problem with video games but others might not share that. Also, on the money thing, I have found that there are lots of other ways for me to have exciting, addictive, joyful fun that are less expensive and don't leave me feeling dull or reclusive afterwards. But I do agree with your last point and I think it was quite insightful - hidden achievements are a good idea, since they get you to replay the game; they give you a sense of exploration on the first run and mission on the second. But once again, is getting you to replay the game a good thing for disciples of Jesus? I'll stick with my answer: it depends on the person. But let's hear that with a different emphasis now: it DOES depend on the person, to be self-aware and to be honest with themselves and with God, and to make the best choices. I think I would agree with Matt - it depends on the person. And the most important thing is what you make out of games and AP's. Hobbies are great, but just like anything else, you need to be willing to give it up if you're called to do it. Perhaps the hardest thing is being able to hear and understand when you've actually been called to give it up.